A hike of new expectations. 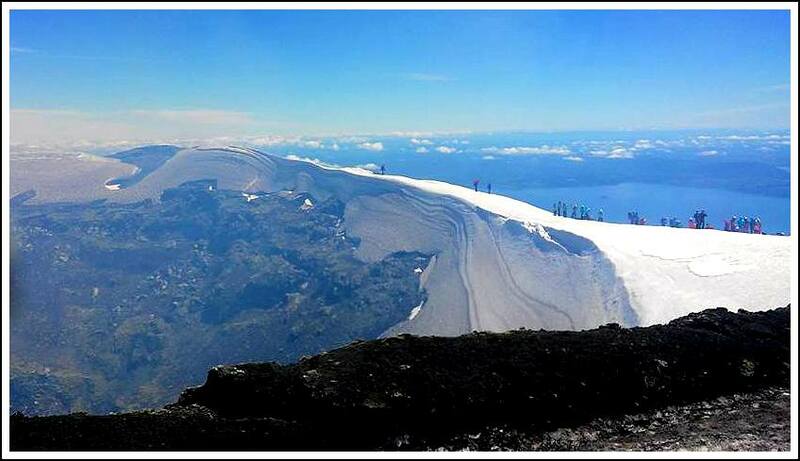 Volcán Villarrica, Pucón, Chile. As it gets colder, I’ve been thinking about a winter I spent in South America. 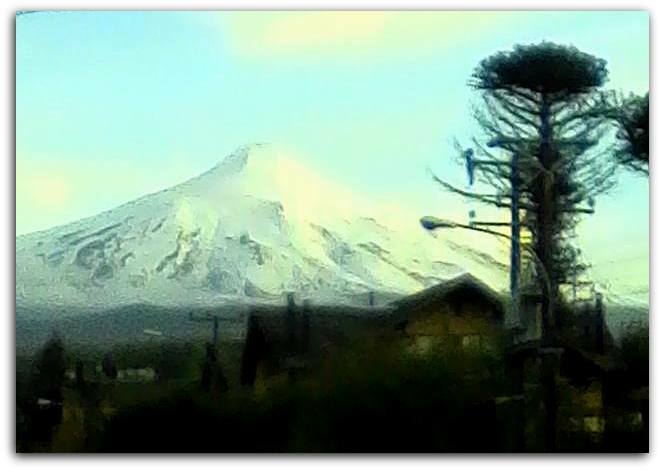 I was living in Pucón, Chile, teaching conversational English to school kids. 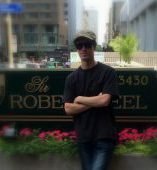 Actually, we had a good time together, and often talked about music, movies, pop stars, and everyday life in the USA. The kids were pretty great, as were the teachers and the townspeople – honest, straightforward, and friendly. 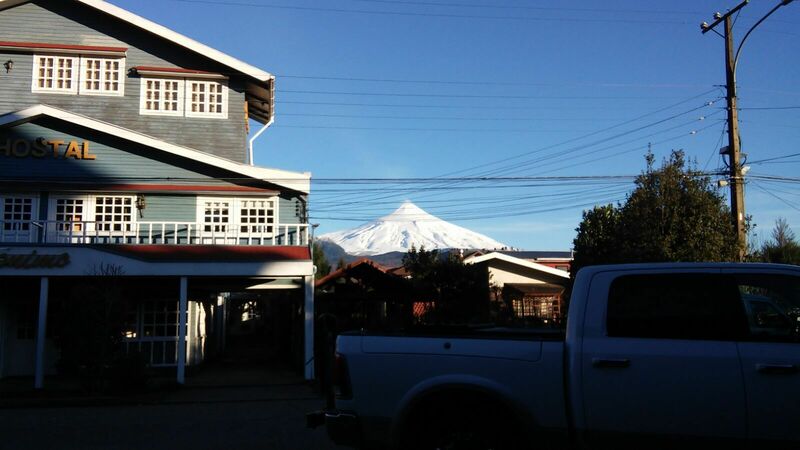 But my entire stay in Pucón, every day, I would look up at a mountain looming over my small wooden village. 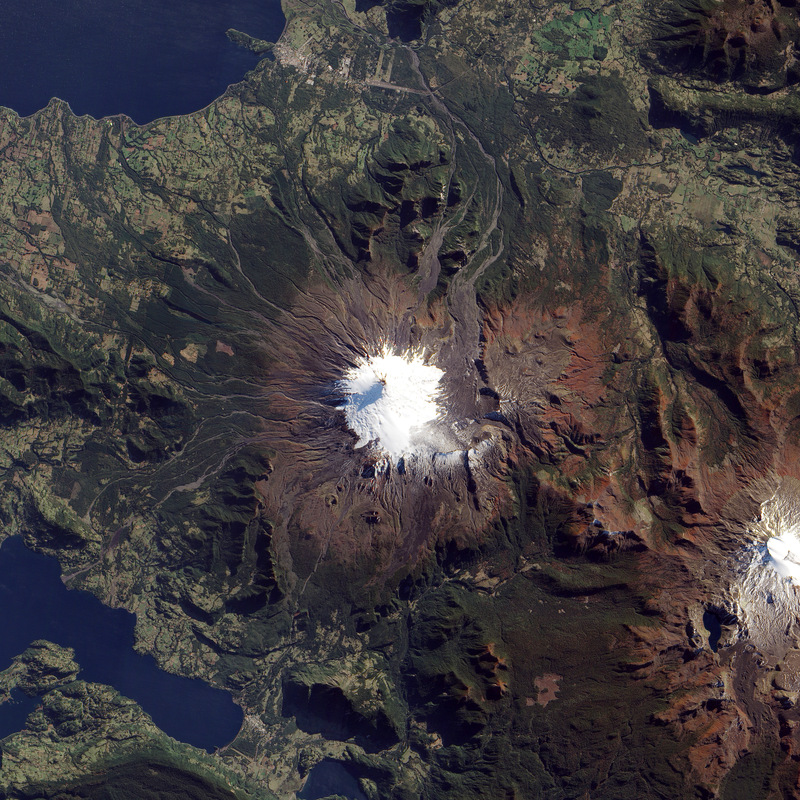 The “Volcán Villarrica” is the country’s most active volcano, over nine thousand feet tall, erupting as recently as 2015, and forcing an evacuation. 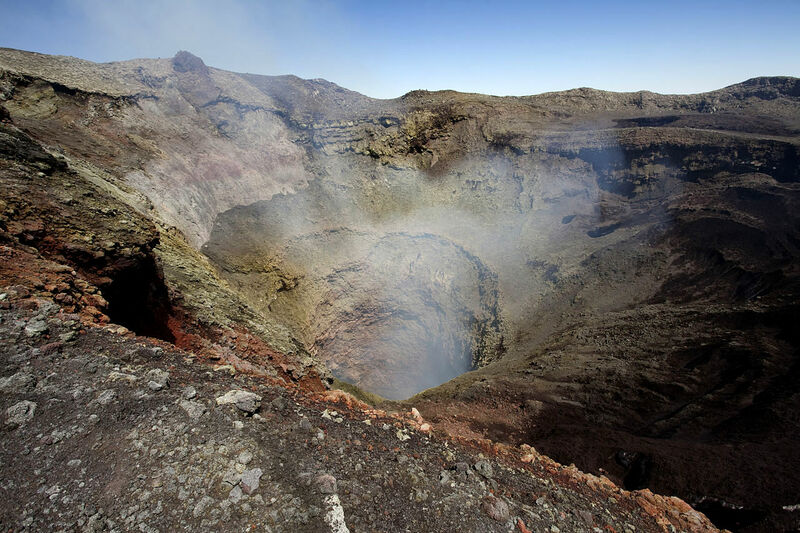 Poisonous gases from the ’74 eruption killed a dozen people in the village. It’s been carrying on like this for centuries, and the conquistadores recorded events back in the 1500’s. After I returned home, I read that the indigenous Mapuche called it “The Devil’s House,” but I never heard that while I was there. Every day it exhaled smoke, and some days, eating lunch in the teachers’ lounge, I’d look up to see it bellowing out. At night, I walked under a sky of unfamiliar stars (different from those on my side of the equator), feeling disoriented, and I’d see it, snow-capped year-round, a mass of blueish white against a backdrop of deep black. 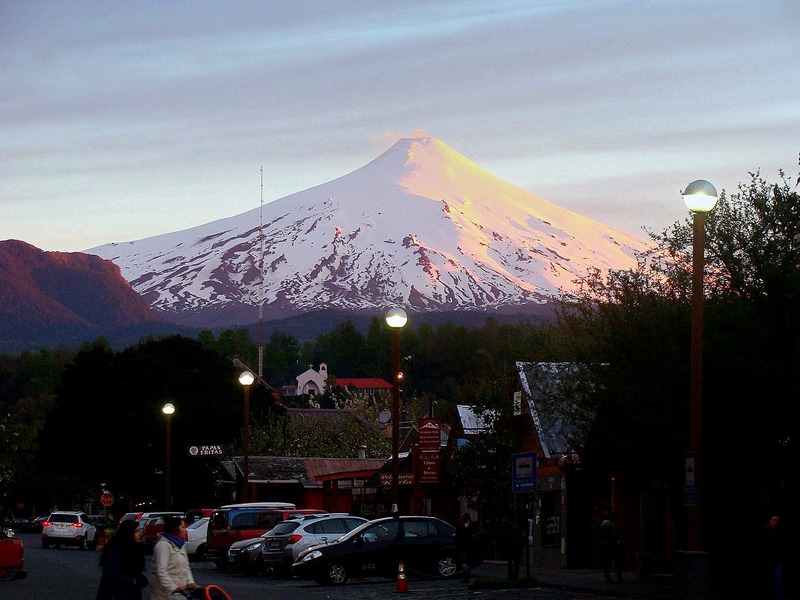 I strolled through Pucón’s streets, and down to the lake, down an unlit lane that gave me the creeps, between the baying stray dogs and the croaks of death-bird ibises, and from that pitch-black area, I’d look up to see there was a dim reddish glow above the summit. It looked almost fake, like a movie set, maybe the Paramount Studio’s mountain. But this was real, and that glow was from the lava lake, thousands of feet above the town. Every day, I would look up to see this menacing-looking mountain. I often wondered when it would next erupt, but figured the smoking was good, it was letting off some steam, so to speak. 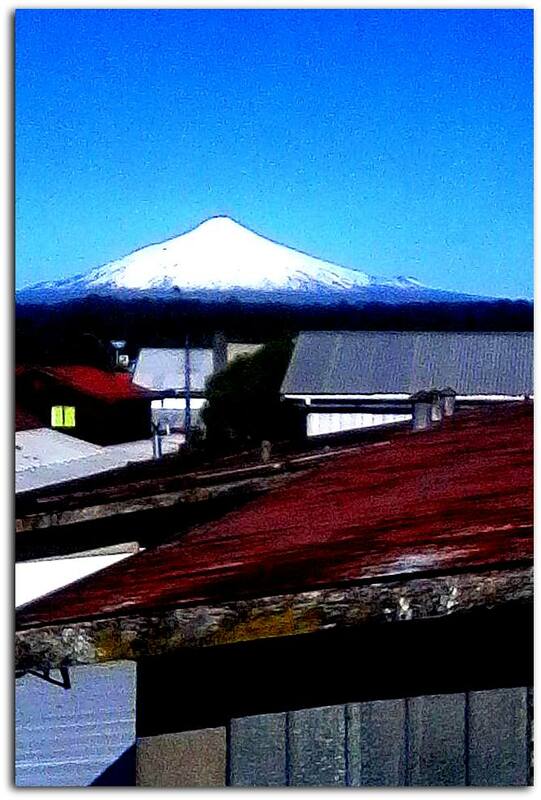 Over coffee, my friend Paul suggested that instead of watching the volcano every day, we might as well climb it. I was surprised that I hadn’t come up with that idea; I guess I didn’t think it was feasible. I’m not a mountain climber. I grew up in a town a few hundred feet above sea level, and liked it there. Pucón was only a couple hundred feet higher. Perfectly fascinated by looking up at the volcano, it had never occurred to me to climb it, and thus look down from it. I was surprised not only that I had agreed to the climb, but also that despite my fascination, it never even crossed my mind to do so. 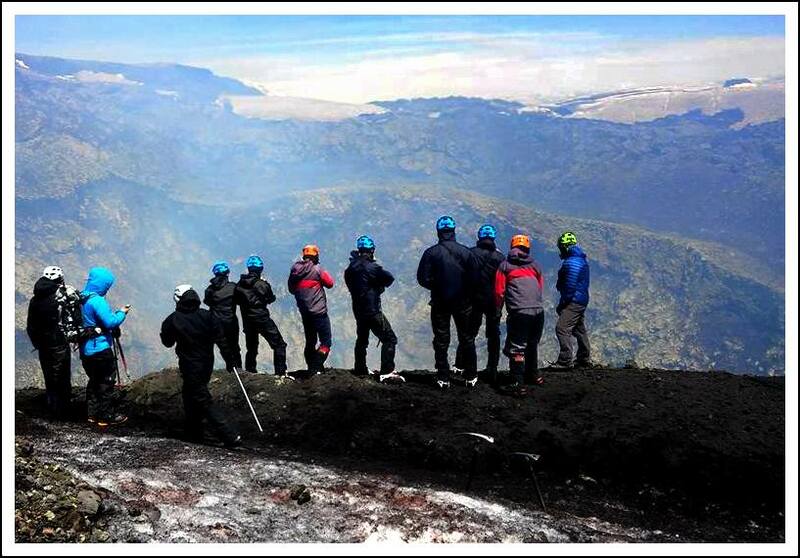 I think of myself as being fairly responsible and not at all daring, and yet, without a moment’s hesitation, I agreed to climb an active and smoking volcano. Not surprising, was that my planning and preparation were entirely non-existent. I suppose, had I planned or had any expectation of what it might entail, I wouldn’t have agreed to do it. So we set out to find which one of the local eco-tourist outfits offered the best deal on volcano hikes. Then, we set out to climb the beast. It was an early morning, and as the realization dawned, of what I was about to undertake, I was a bit worried. We were given an obscene amount of gear, all of it strapped to our backpacks and belts that were loaned to us for the hike. We drove up to the basecamp, and from there we were to hike up with a guide. There’s a chairlift that gets you as far as the snow zone, but our group didn’t take it, adding an extra hour to the hike. It was not as easy as I had expected. Foolishly, I figured it would be solid rock, a bit steep in parts but no biggie. It wasn’t. It was like walking on a beach, except uphill, and over bits that would sink deep below our feet or sheer off. Volcanic tufa on top of hard rock. Slowly we zigzagged across the mountain until we reached the ice. That was when we were instructed, to put on the heavy winter coats we were carrying. And then the winds picked up. As we hiked it became evident that we had a long way to go. Our guide was very nice, but kept us moving, telling us several times we couldn’t stop or we would die when the wind changed, something that had happened to a French family who went without a guide a year or so ago. As we walked, eventually with crampons strapped onto our feet to get a grip on the icy surface of the volcano, I became a bit uneasy. There was 25% less oxygen than I was used to, and I was getting short of breath. Our pace was at a decent clip; we had to reach the summit in a certain amount of time, for some sort of safety and weather protocol. When we had breaks, we would sit down on the cold surface and feel how our muscles ached all over. Everyone was tired, thirsty, and no one looked like they were enjoying themselves. There were some pretty spectacular views, but as I looked up, to my dismay, it looked like we had at least another half a mountain to climb, it was hard to gauge until we got higher up. There was a large lip of ice hanging off of the volcano about 3/4 of the way to the top, and from the basecamp it appeared to be the summit. I was less certain I could make it and increasingly unsure I would be able to breathe at the full altitude of 9400 feet. I was already struggling and feeling light-headed and began to imagine passing out and rolling off the mountain to my death. No one but Paul knew me; my family did not know where I had gone. The distance between us and the other groups grew wider and wider and soon even our guide was ahead of us a bit, though at last he stopped for us to catch up. I recall sitting under an icy ledge as the wind picked up. I don’t know how fast it was but everyone was straining against it, and we felt cold through our bodies. As we lay against the ice, on mats that weren’t quite big enough, I began to really panic. What if I didn’t make it all the way up? How was I to get back down? I couldn’t quit. One of the guides was going up the mountain, UPHILL, the entire way, on downhill skis. The amount of strength and stamina humbled me and shamed me into walking more. Paul, a fellow English teacher from Dublin, was the one who got me through. Just as running is best with someone to help you go farther, so is hiking. I do not think I could have made it had I just gone myself. But Paul encouraged me step after painful step, and got me psyched up enough to continue. It was painful, with my sides cramped up and legs like lead and my head heavy, but we made it to the top. He got me into this mess, but he got me through it. The view was stunning. 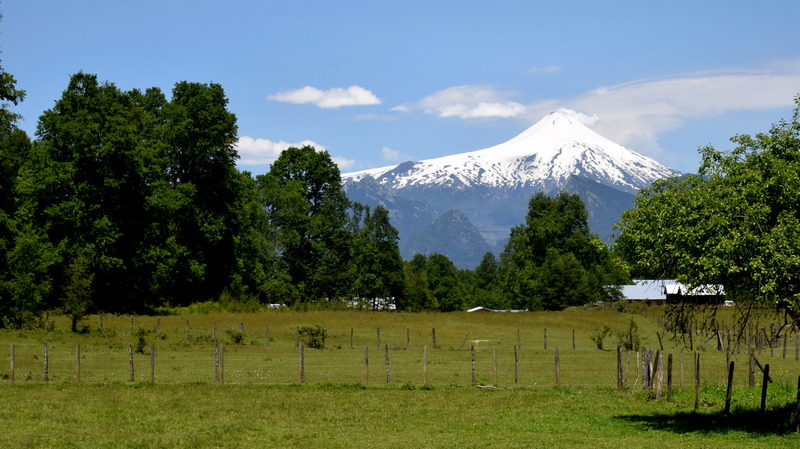 Pucón was tiny, as was Villaricca and all the many other villages in the distance. 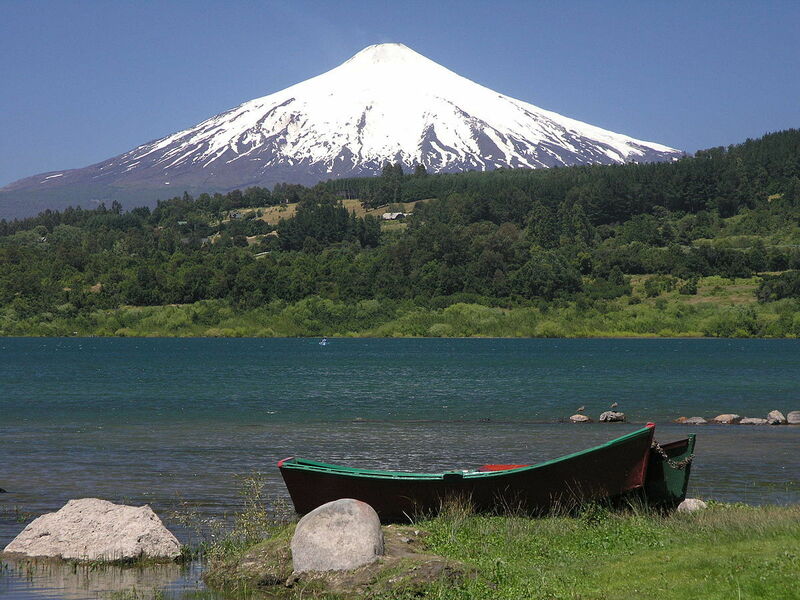 We could see to Argentina, the mountains and volcanoes on the border of the two nations were an incredible sight. The crater itself was releasing gas and despite the gas mask my eyes were burning and I kept coughing. I wasn’t able to spend more than four minutes looking, as I felt myself feeling more and more sick. So much for that, I thought. Despite the spectacular views, I was underwhelmed, I’d expected reaching the summit to be more rewarding, somehow. The highlight turned out to be the way down. We used the small round disks we had lugged up there, like heavy-duty versions of the “flying saucers,” when we were sledding as kids. We strapped it on, and rode down the slope, using our ice picks to slow our descent so we didn’t die, careening along the mountain. My pick was ripped from my hand, so I had to claw my way back up the mountain to retrieve it. Paul couldn’t control his and crashed, banging himself up pretty badly. It was the most painful sledding I had ever experienced, but the ride was exhilarating. We descended about 2000 feet starting at the 8000 foot mark, so the world was literally racing by us and it was quite the thrill. Also the fact that it seemed we could be severely injured, or actually die at any moment, made it more thrilling, even if terrifying. At that speed, all of my remaining energy was focused on making it down in one piece. 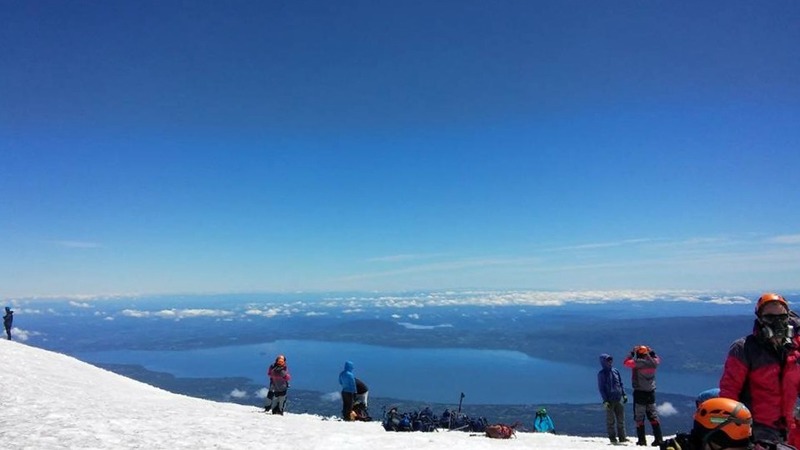 It was only after I had made it to the bottom, crampons removed, ice pick stowed away so I’d never have to look at it again, that I began to realize what I had done. In many ways, the hike was a bust. I was in pain and exhausted. But the experience taught me humility. I think part of that stems from being let down. I don’t know what I was expecting, but it wasn’t what I experienced. In fact, I think back, three years later, but my expectations remain unknown even now. The following morning, bruised, stiff, sunburned (the sun is a lot more intense when you’re a mile up a mountain), I looked at the volcano again. This time, my slowly functioning brain registered awe. Before, it seemed unreal. After the hike, it became almost too real. This was a monstrosity of nature, bent on breaking our will, and difficult to climb. 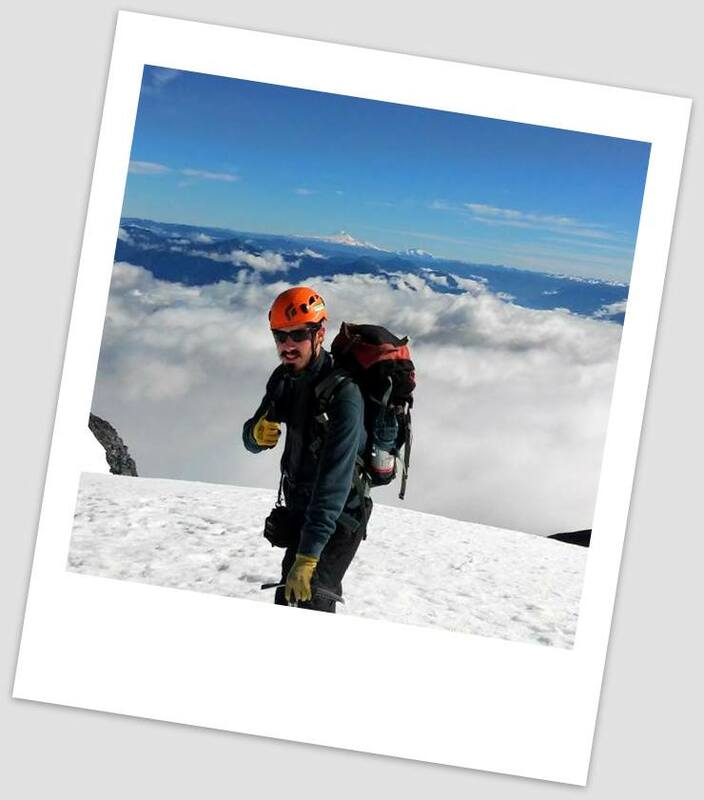 I felt less like a champion who bested the mountain, and more a sense of awe. I survived without any preparation and zero thought given towards this venture. I was so confident when I began and then so thoroughly humbled by a natural force much greater than myself. Hardly a stroll in the park. I also learned that I could test my strength and overcome my previous limits, and it was all thanks to a combination of the urge to survive mixed with an encouraging friendship. I will probably never climb a volcano again, which should not be an issue living in New York or Wisconsin. But still. It was a heck of a trip and won’t soon be forgotten. Occasionally, when tasked with a “mountain” of work, I return to this moment. Not to feel too cocky, but to be realistic with my expectations of what can be accomplished and how to get the job done.